A couple of weeks ago, I noticed a little issue going on with my gum. Not my chewing gum — the gum beside one of my teeth. After doctoring it at home for a few days, I realized it wasn’t going to improve. So I made an appointment with my dentist. After probing (ouch!) a bit and taking x-rays, his opinion was that the tooth beside the affected gum should probably be extracted. 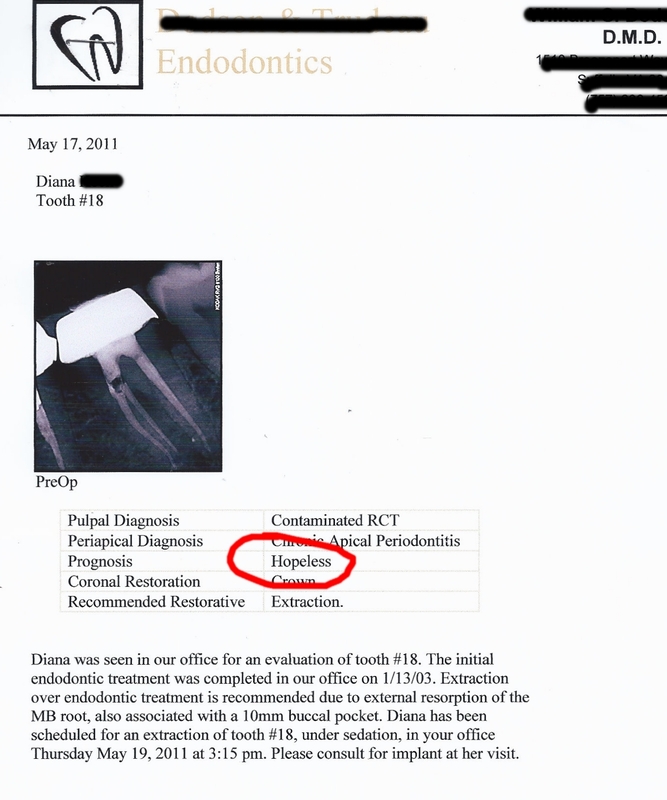 But he wanted me to see an endodontist to get a more expert opinion. The appointment with him was yesterday. Here’s his prognosis, circled in red. “Hopeless” seems like an odd word to use in this case, but I guess it works. To add insult to injury, they spelled my name wrong; in my world, Dianna has two ‘n’s. This tooth earned the “The Golden Tooth” award from me several years ago. It has a crown, plus a root canal done THROUGH the crown. The endodontist explained that when we lose a baby tooth, the roots are “absorbed” as the permanent tooth pushes upward. Sometimes those little root “cells” remain dormant, and they can resurface years later to eat away at the permanent tooth. That’s what he suspects has happened in this case. So I think I’m more than ready for this tooth to be gone. Appointment for extraction is Thursday at 3:15. I probably have as great a fear of dental work as anyone. So I need all of you to be thinking good thoughts on Thursday afternoon. Actually – think good thoughts all day on Thursday; I can’t have anything to eat or drink for 8 hours before the appointment. It’s gonna be a long day.